This derelict barn in rural Oxfordshire has been converted into a rustic yet sophisticated hideaway, cradled by the trees of an immense mature forest. The challenge the the architects from KSR Architects took on in this renovation project was that of opening up the spaces within the preexisting structure, and creating a modern interior without losing the charm of the original building. During this homily 360 degree tour, you'll get a glimpse of a unique building with both historical significance and modern flair – time to take a look! There's no mistaking this country home's origins – a glance at this facade will tell you that this simple and logical form began its life as a barn. With a high, pointed roof with a large attic volume, this structure was originally designed to provide plenty of loft space for storage – and now the space simply serves to create a lofty feel in this now high-ceilinged home. 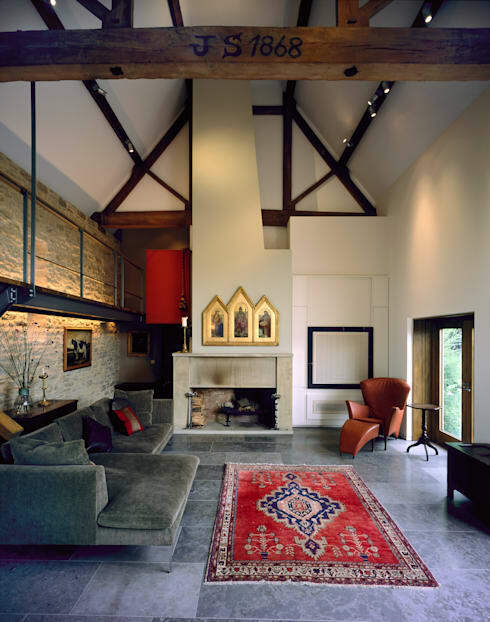 The corners of the structure reveal where the home has been reinforced with modern brick, drawing attention to the impressive fact that the grey field stone walls of this barn have remained largely intact over the decades. 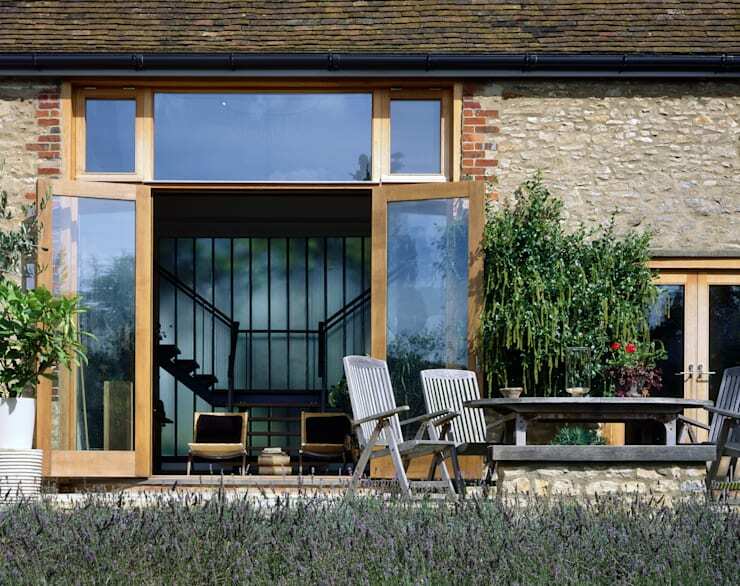 On the side, the barn door has been replaced with a double glass door leading out onto a sunny deck. Once again, you can see where new brick (in red) has been added in order to strengthen the edges of the grey walls, providing a clean line for adding on the modern windows and doors. 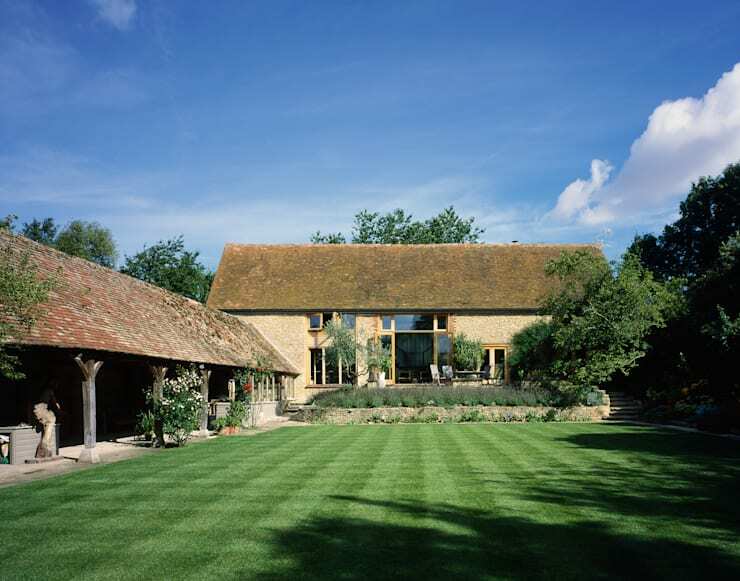 Taking a step back, the side patio gains a whole new sense of scale, with a wide, grassy lawn extending out from a home that no longer looks like a barn, but more like a stately English manor. Meanwhile, a livestock shed along the left offers a vision of history, bringing context to the renovated house structure. Inside, the home is an eclectic blend of rustic and modern elements. The wooden beams still showcase the barn as it has stood for decades, and a few antique pieces tell their own time-tested tales as well. Meanwhile, the room enjoys modern elements as well, like the modern artwork, the interesting sculpture by the window, and the long staircase that meets at the central point of the room. High above, a few hanging lightbulbs give off an urban, industrial feel. The central room of this home is truly the heart of it all, and the hallways have been designed to give you an open view of this spacious living area. 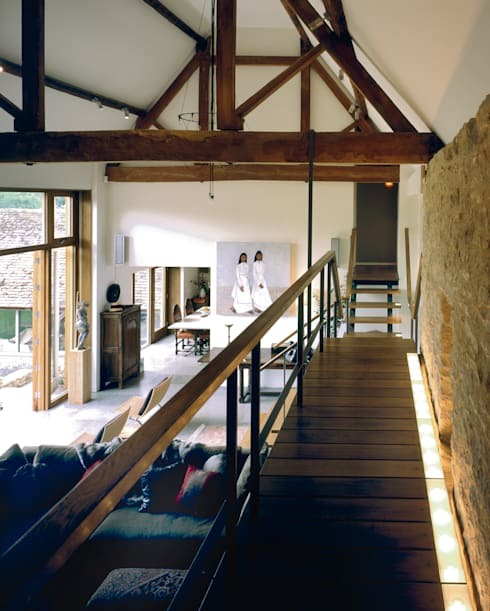 These illuminated boardwalks run alongside stonework from the original building, allowing you to appreciate the juxtaposition of trendy and modern floor lighting with rough, textured stone walls – and don't forget about the high, pointed ceiling that gives this room its sense of loftiness! In a blend of just about everything, this living room has many different stories to tell. A curvy red chair speaks of contemporary design, while a Persian rugs speaks of exotic places. The stone-framed hearth at the end of the room has a more majestic story to tell, ornamented with a glowing display of religious artwork. A picture along the stone wall seems to come straight from a rustic farmhouse, while the plush grey sofa makes a trendy urban statement. And with such a lofty and spacious place for these styles to mingle, this living room has enough room for it all. For another look at homes that have been updated, converted, and transformed, have a look at these 5 Fantastic Family Home Transformations – one even started as a garage! 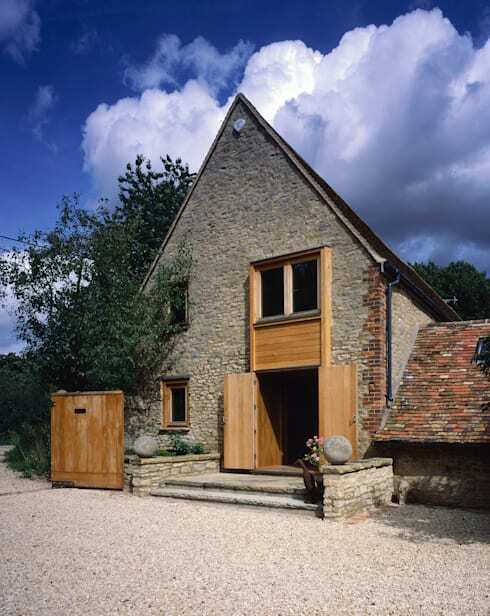 What do you think of this converted barn home? Comment below!